Not to be confused with Mandera County. Mandera (Somali: Mandheera) is the capital of Mandera County in the former North Eastern Province of Kenya. It is situated at around 3°55′N 41°50′E﻿ / ﻿3.917°N 41.833°E﻿ / 3.917; 41.833, near the borders with Somalia and Ethiopia. Mandera is the capital of the Mandera District. As a whole, it used to constitute one district, which was divided into three smaller constituencies; namely, Mandera East, Mandera Central and Mandera West. 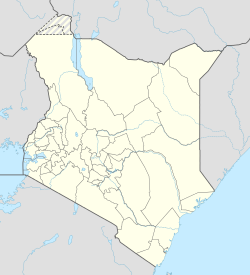 However, Kenyan President Mwai Kibaki in 2007 ordered the creation of two more districts: Mandera Central Mandera West Lafey, Mandera north and Banisa. This brought the total number of local districts to six. The town occupies an area of 26,744 km². As with the other areas of the North Eastern Province, Mandera is predominantly inhabited by ethnic Somalis with the Jiidle murule tribe as the majority in the county. Mandera's climate is categorized as arid under the Köppen climate classification. Temperatures tend to be hot throughout the year. Daily temperatures are typically above 30 °C (86 °F), while at night, they can fall to 20 °C (68 °F). Precipitation is extremely low, with the area receiving a minimal amount of rain. Droughts are not unusual, often resulting in significant loss of livestock in rural areas where pastoralism is common.